For many years, Flexitank has been the Australian manufacturer of ContainerPac flexitanks, which are disposable flexitanks for bulk liquid transport in 20 and 40 ft containers. 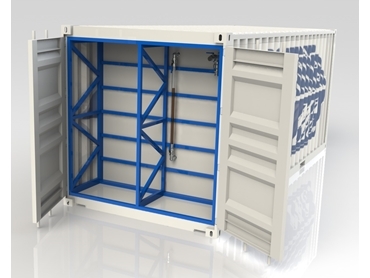 Over this period, Flexitank has designed and delivered a number of specialised storage solutions for customers wanting to use ContainerPac flexitanks as static, medium to long-term storage solutions. Off the back of this demand, Fexitank are proud to announce the creation of a new range of StoragePac liquid storage containers. Primarily designed as a self contained unit for the storage of fuels and chemicals, StoragePac liquid storage containers offer the ability to convert standardised containers into self-bunded liquid storage tanks. These new liquid storage tanks feature recessed bulkheads that stop the bladder from deforming and allow pumps and fuel bowsers to be stored inside a container. When they are empty, the StoragePac can simply be lifted onto a standard container truck and transported. Gavin Hodgins, Flexitank’s Operations Manager, is sure that after two years of product development this range of liquid storage tanks is able to tackle every imaginable issue. "From specifically designed stainless steel fittings to USA sourced vents and relief valves, we firmly believe the StoragePac range of containerised tanks offers excellent value for money whilst providing a high quality solution in an area that is crying out for innovation,” says Hodgins. Each StoragePac liquid storage tank is supplied as a ready to use item with all installations conducted by Flexitank’s own expert installation team. As the liquid storage solution is also completely portable, tank installations are hassle-free, relatively quick and do not require building permit approvals to be used onsite. All supplied fittings are flanged and in 316 grade stainless steel with 3” fittings. Each StoragePac liquid storage tank is also supplied with level gauges, pressure relief and anti vacuuming valves, and optional whirly birds for internal ventilation. StoragePac tanks are also lined with a specially designed thermal liner to ensure all stored liquids have excellent temperature control. Self-bunded with secondary containment included as part of the system, these tanks meet all EPA requirements to store sensitive liquids. They offer a greater economical option than traditional dual layer steel tanks and Flexitank offers a complete range of pumps specific to each product. Export orders from remote mining sites in Papua New Guinea and Africa have already been received, and there is significant interest in the solution from various Middle Eastern companies where storage and transport of all liquids is problematic.